Since 30th April 2018, the beta version of Orbit Intelligence has been offering a redesigned and far more efficient patent assignee search section (see communication here). This enhancement will now be available in the regular version, for all users. The new design enables users to select and combine company names selected in the corporate tree, or as a "free entry" in the dedicated box. The "select" button opens a zone where a company name can be typed to list the subsidiaries. The "free entry box" allows users to type any name and add them to the query. 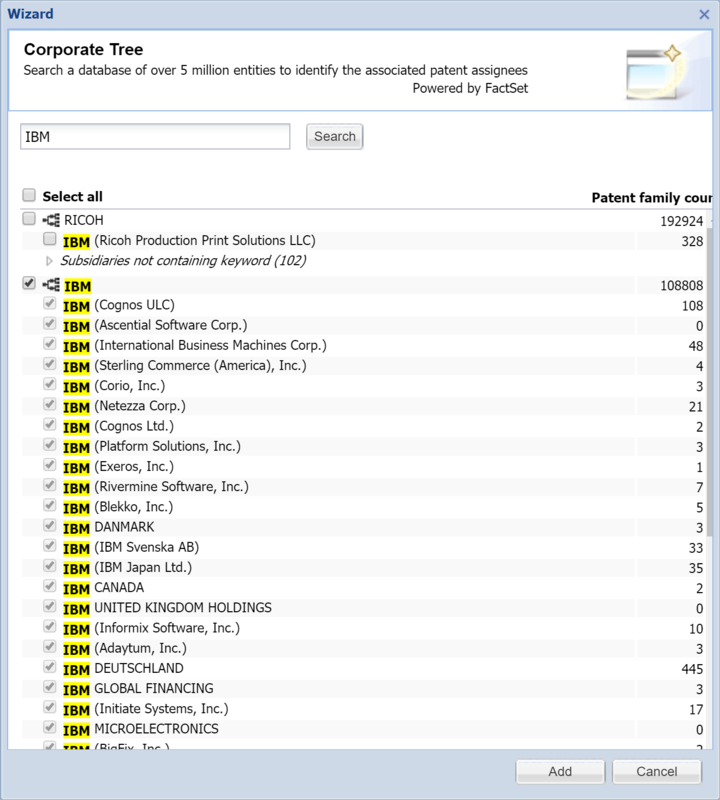 The new corporate tree now limits the subsidiaries to patent assignees only and displays the actual number of patents for each subsidiary. To make the selection more efficient, the searched terms are highlighted across all occurrences. Once the selection of relevant subsidiaries has been made, a chip is added underneath the entry box. Any selection of companies made from the corporate tree is flagged with a "corporate tree" symbol. It is now possible and very easy to combine several company names in a single query, whether they are originating from the corporate tree wizard, or from the free text entry box. Typing other company names in the free text entry box followed by a click on the " + " sign (or the " enter " key) creates a chip for each name, added to the list of companies to be searched, underneath the entry box. Any entry can be removed from the list by clicking on the cross in the chips. Unchecking the "search only current assignee" box de-activates the corporate tree option ("select" button) and activates the "dictionary" wizard, which lists the occurrences as identified in the database, listed in alphabetical order.